Last few days I spent with describing a Throttle mechanism using the DB Adapter. 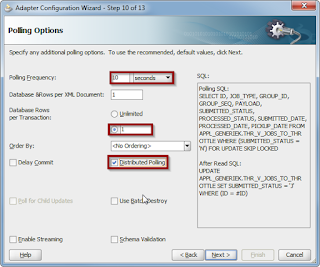 Today the 'Distributed Polling' functionality of the DB Adapter was mentioned to me, which uses the SKIP LOCKED clausule of the database. Leave it like it is, since it adds the 'SKIP LOCKED' option in the 'FOR UPDATE' clausule. The 'RowsPerPollingInterval' is not an option in the UI, unfortunately. You might want to set this as a multiple to the MaxTransactionSize (in the UI denoted as 'Database Rows per Transaction'). 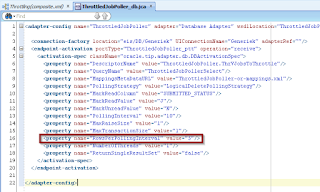 A great explanation for this functionality is this A-Team blogpost. Unfortunately the link to the documentation about 'SKIP LOCKED' in that post is broken. I found this one. Nice thing is that it suggests using AQ as preferred solution in stead of SKIP LOCKED. minimumDelayBetweenMessages; see this forum thread or note 465747.1 in support.oracle.com. 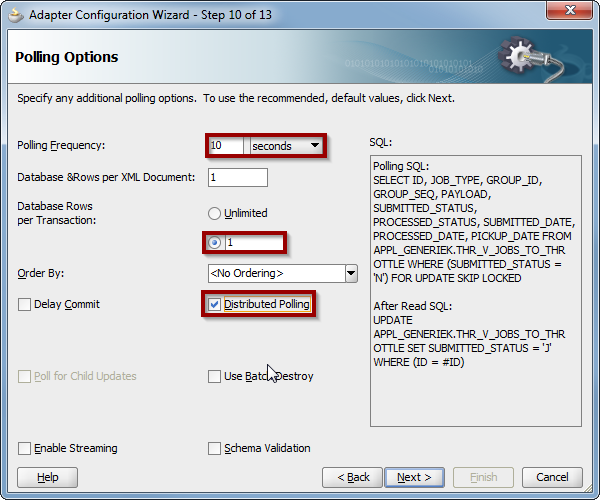 End of last november I wrote about the BPM 12cR2 quickstart download, describing that the links weren't updated. For a new install I did a new download and found that in the meantime the links are updated. You can download the quickstart here. 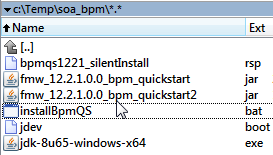 A few weeks ago I wrote a little script to do a silent install of SOA/BPM QuickStart. Yesterday I enhanced the script to also do an automatic install of Java and adapt the environment settings to have the JDeveloper settings specific placed in C:\Data\JDeveloper\SOA. Download the jdk-8u65-windows-x64.exe from here. If you use another version adapt the script below to change the JAVA_HOME as the place where it should be installed and the reference to the installer (jdk-8u65-windows-x64.exe) to the version. The script below ignores any other installation of Java (either an other update of jdk8 or earlier versions). # product will use its base directory as the user directory. A copy of this jdev.boot file I placed in the same folder as the script. The scripts sets the FMW_HOME as 'C:\oracle\JDeveloper\12210_BPMQS'. After the install of JDeveloper-SOA/BPM QuickStart, it copies this jdev.boot file to the right place in the FMW_HOME (%FMW_HOME%\jdeveloper\jdev\bin). Make sure that you have the installer jar files (fmw_12.2.1.0.0_bpm_quickstart.jar and fmw_12.2.1.0.0_bpm_quickstart.jar) unzipped in the same folder. You could have downloaded them in zip files. You can use this script also to do a complete silent install of the JDeveloper Studio Edition, but then use the generic installer downloaded here (Oracle JDeveloper 12c 12.2.1.0.0 Generic/Others(2.1GB)). The installBpmQS.bat script is as follows. echo setx -m JAVA_HOME "%JAVA_HOME%"
echo copy jdev.boot naar "%FMW_HOME%\jdeveloper\jdev\bin"
Save this as bpmqs1221_silentInstall.rsp. If you use this for the installation of JDeveloper Studio Edition or any other version of JDeveloper, then adapt the name, also in installBpmQS.bat above, and adapt the FMW_HOME/ORACLE_HOME in both installBpmQS.bat and the response-file.